William Eggleston is a major American photographer - he is listed on the Masters of Photography website - and so, unlike most of the other photographers reviewed on Metapsychology, it is possible to find a fair number of websites discussing his work. 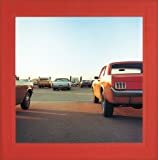 Some people have disputed whether Eggleston's work is art, because his subject matter is generally banal - cars in parking lots, cars in driveways, abandoned cars by the side of the road, a billboard and advertising signs. What's more, his depiction of these items is apparently without irony, indeed almost without any comment at all. Eggleston seems to love simplicity; rarely do his pictures include human subjects, and when they do, the people are not very active, maybe just reading, or looking into the camera. The many cars pictured are not moving, and they don't even have anyone behind the wheel. There's a stillness and quiet to these images. It is hard to find any social commentary here, even though the subject is the South of the USA. Even in the picture of a Winston Lights billboard on the top of a building, with a wall painted orange and a couple of air conditioners sticking out, under a blue sky, with black car parked next to the building, there's not a hint that Eggleston is interested in the role of tobacco in the south. It seems that the sign is chosen simply as a subject because the color of the cigarette packet and the lettering match the color of the wall. Eggleston frames his shot purely for aesthetic considerations. If there's a social dimension to his work, it seems mainly one of love for the unconventional beauty that he finds. Many of his images have a sense of composition similar to that of minimalist art, almost as if Eggleston sees his pictures just as patters of colors. In short, most of his work seems to avoid any attempt to make a statement about contemporary society or the quality of lfe. On the other hand, there is an emotional tone to these images; nearly every one, even those featuring people, has a sense of emptiness, their beauty of the composition notwithstanding. A boarded up house with a piece of wood with "CAFE" painted on it nailed to the front looks desolate. The neon "BAR & LOUNGE" sign glows at dusk, but there are no windows in the side of the building facing the camera, and there's nobody going in to eat. A household electronics store is covered in homemade and cheap signs; a small sign on the door handle says "OPEN COME IN" but there is nobody around, and it's hard to imagine that the store is doing well in its competition with the local WalMart. Even a shot of a bright red shiny truck lit by the sunlight, which seems to take a boyish pleasure in its subject, shows an empty cab, and no surroundings to tell us who owns the truck or what it is doing there. The pictures don't even have titles. It would be possible for a photographer to take the same pleasure in colors, using real objects to create careful compositions, and to find beauty the scenes in the American South while at the same time depicting warmth and connection in people's lives. But that's not Eggleston's style, and even if some may find his work too formal to really love his work, his consistent ability to find and frame the ordinary in unexpected ways demands admiration.